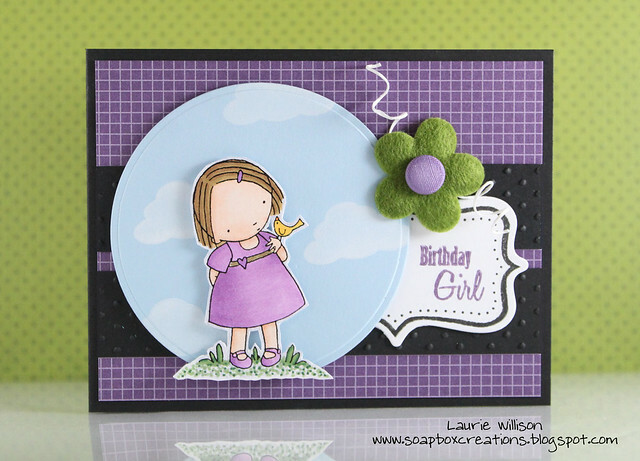 I am here today with two Papertrey Paperdolls Challenges! The first is Anika's. Her challenge was to find inspiration in a food wrapper! 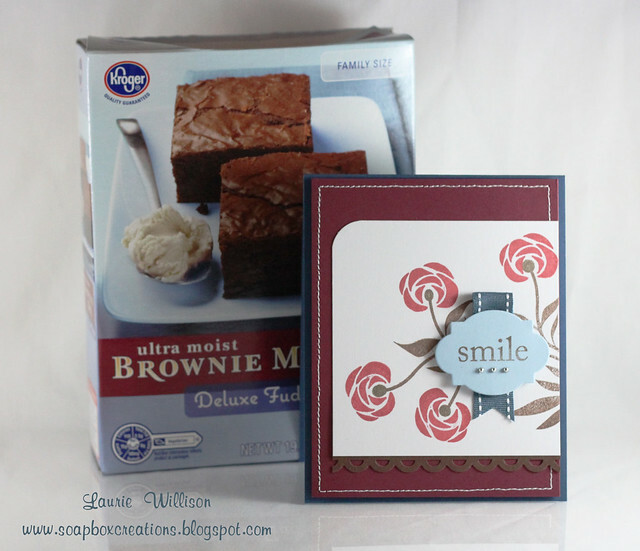 I found so much inspiration that after I made the card, I also made the brownies! You can see the open box in the picture....YUM! The next Challenge is from Michelle! That was to ink up a set that hadn't been inked before and to use a brand new product! I have never used Scarlet Jewel before and I JUST got my CHA set in the mail! When I got to CHA they were out of the free set! 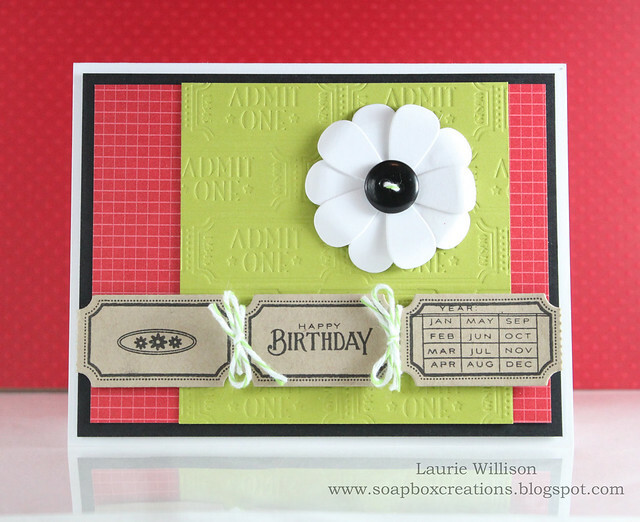 So here is my first card using my new set! To the Dolls: I am so sorry I haven't been participating in the last few challenges! It has been crazy around here! I plan on catching up! Thanks for stopping by today! Hope you all have a great day! 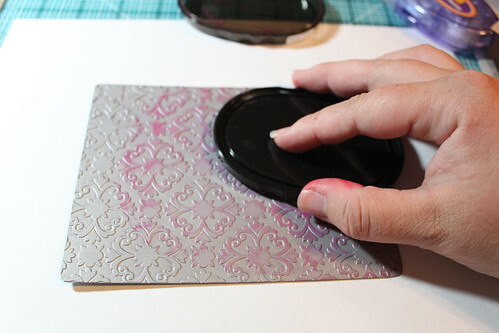 I have been stamping now for only about 3(ish) years. I knew when I was first introduced to it, I would be a lifer! I love this hobby and it just brings me so much joy and STRESS relief! I have used alot of different brands of stamps but I would have to say once I found PTI, I just fell in love! 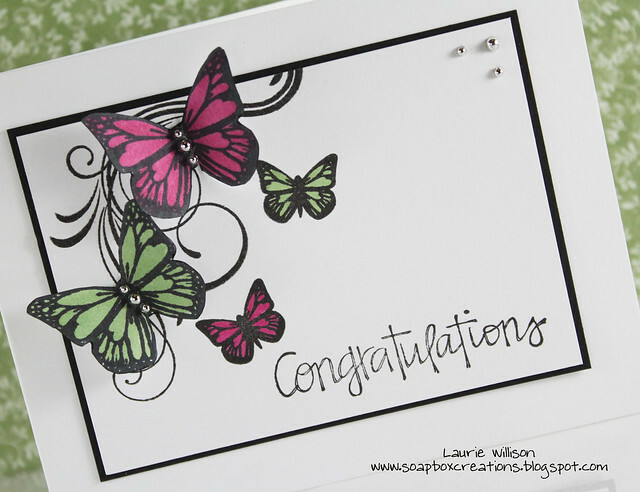 The stamps are so versatile and just so fun to use! The quality of their product is fabulous and that is so important! 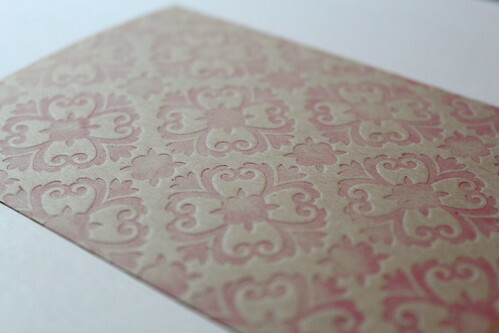 More than that though is the inspiration that we all get from one of the owners of Papertrey Ink, Nichole Heady! She is so amazingly talented and shares that with each of us! 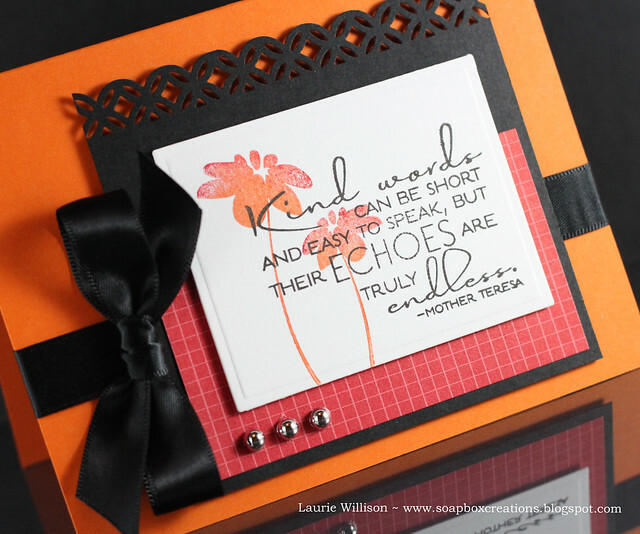 She has inspired so many and she has transformed the world of stamping for me and so many others! You can tell she really pours her heart into this craft! With that, I have to say Thank you Nichole, Julie, and Jane for providing us with something that we can love just as much! It's amazing how we can all have such an addiction to paper! 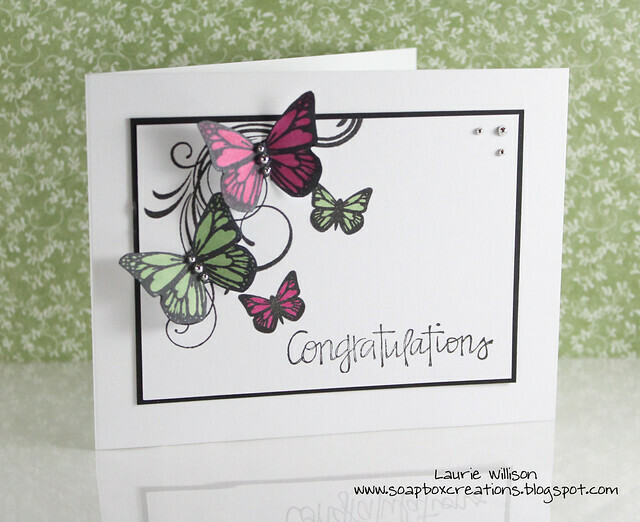 :) So here is a simple little card just for her and the Papertrey team! Thanks for stopping by today! Hope you have a great Monday! Thanks for stopping by today! Hope you have a great week!! 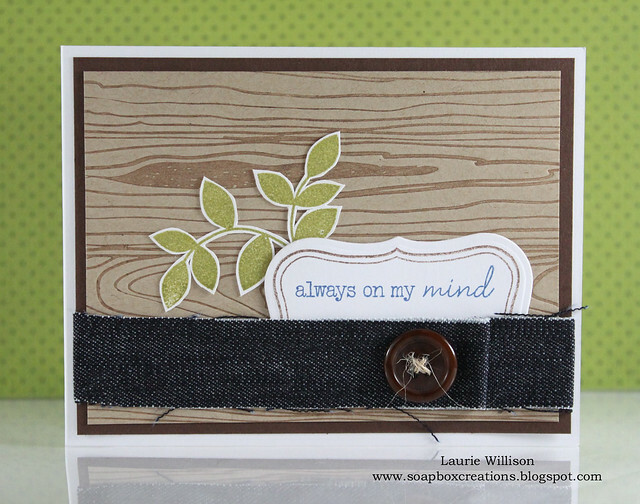 Stopping in with a new card this morning that I think is kinda cute! 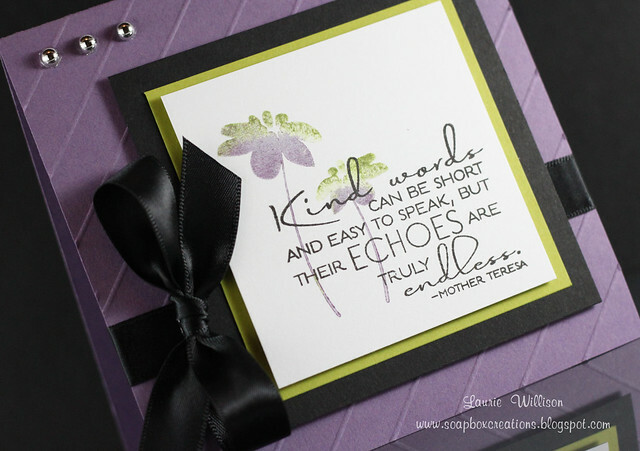 In my last post I talked about a new batch of Verve Stamps! Well this is a sentiment that they have that I wouldn't have known about if Jen hadn't said it was already in her cart! Thanks Jen! 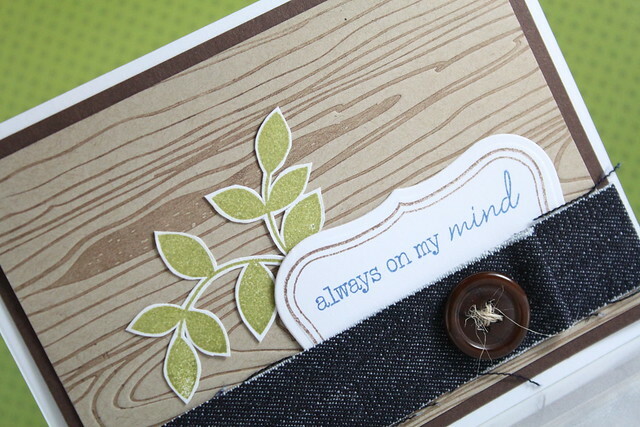 I mean really though...I do love this sentiment stamp! It is super cute! So glad I didn't miss out on it! I used the new Guidelines IP for the background! I thought it gave a kinda' quilted look! 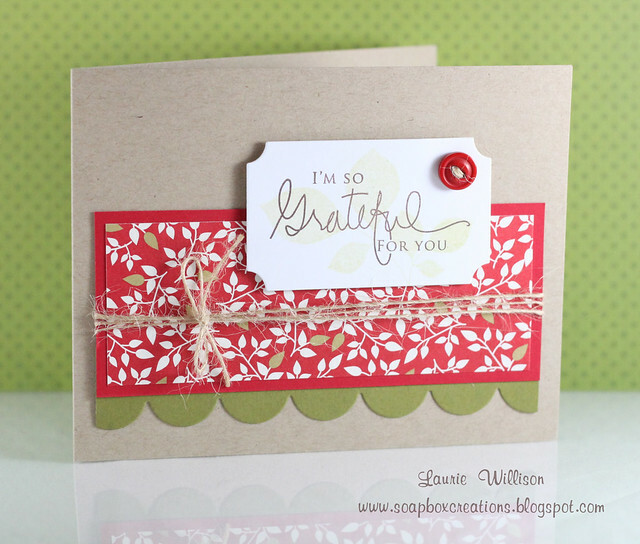 I used Bitty Blessings to stamp the little images inside each block! Oh and the star is from It's Official too! I also had to break the hoarders cycle and actually use some of that felt that I keep locked safely away! LOL! It's also pretty hard to see but I added some Sand Spica Pen to each of the stars and dots! Gives it a fun "twinkley" look! This card also has my new favorite yellow...Harvest Gold! Seriously the best yellow ever! 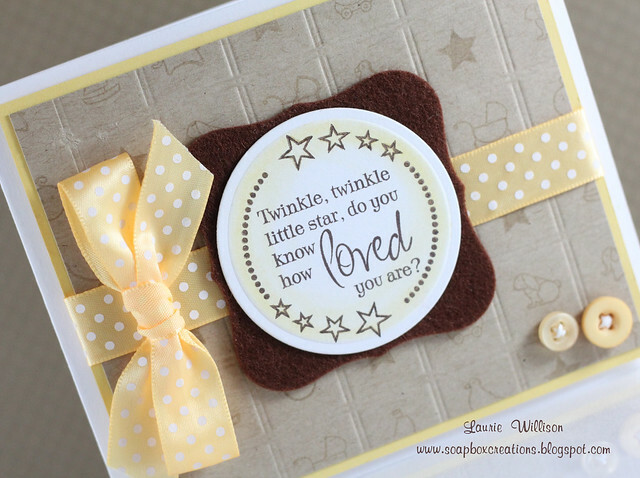 I have so many orders for baby cards and I know this will be a fun one to add to my sale box! Hope you like it too! 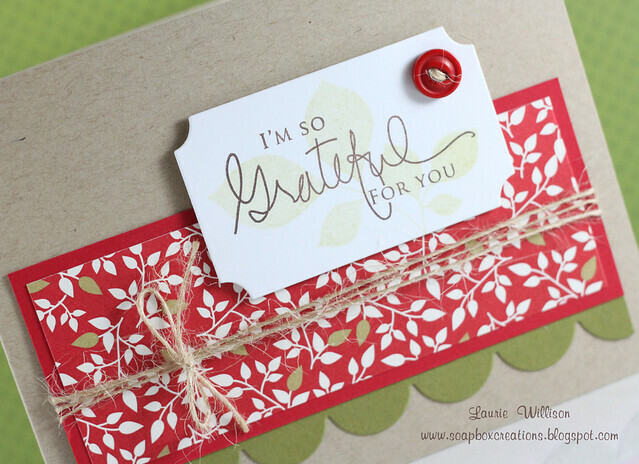 One more note....I have had so many sweet emails asking for an "Email Subscription" tab here on my blog! After a good battle with blogger, I finally figured it out! OH and some help from my good friend Jen! Thanks Jen! You can find it in the right column now! HTH! So my friend Jen and I were talking the other night and I told her that I felt like I really wanted to use my cards for some type of Minisity! We decided that we would start sending out one card per week to someone in our church or the community who needs a lift! 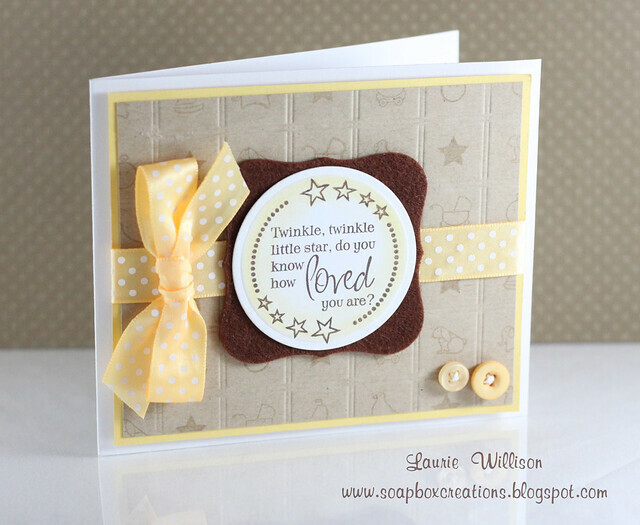 So we are here today to share our first cards for our little card ministry in a Very Mini Blog hop! So "mini" infact, that it is just Jen and I! 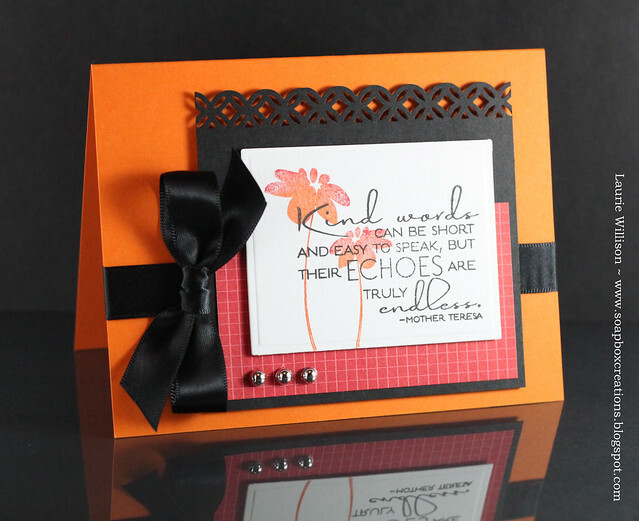 Click HERE to see Jen's card! 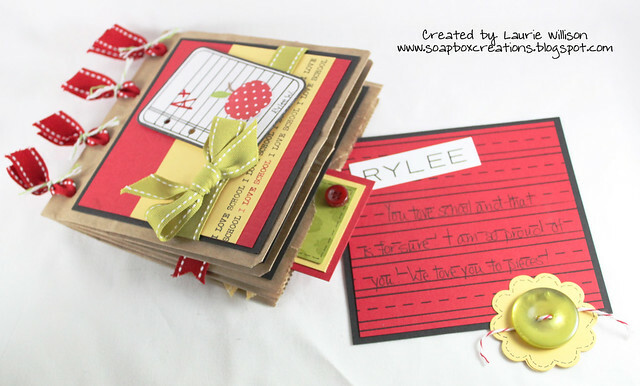 Verve has the most amazing scripture stamps and so I went and loaded up my cart! I ordered on a Sunday night and got them on Wednesday! Talk about FAST shipping! And I just LOVE these stamps! EDIT: I just got a message from my friend....check THIS out! Pine did some amazing things with this technique! We were thinking along the same lines! What I did was take the impression plates, rub ink all over them, center the card stock and then ran them through my Big Shot! 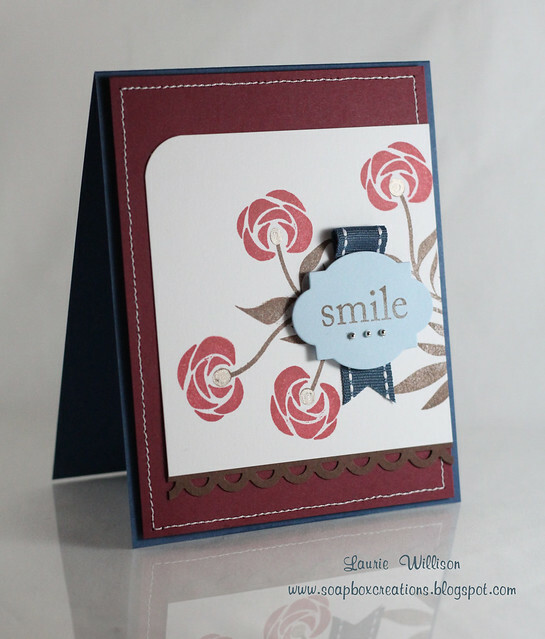 Here are 2 cards I made using this technique and at the end I have some pics of how I did it! 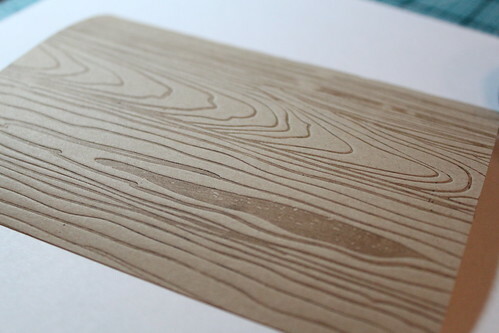 I think it looks AMAZING with the wood grain plate! So much texture already but the ink just adds more! 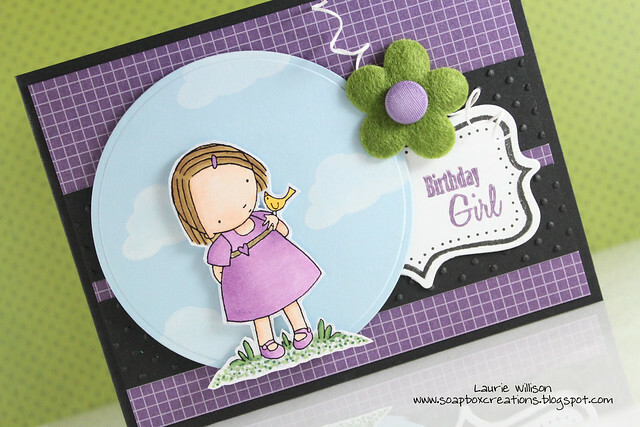 Then I made a more "girly" card to go with the first card! I tried to use some bright colors I might not usually use! :) On this impression plate, I used Raspberry Fizz! I have to say looking back I wished I would have re-inked my RF pad but it came out ok, but just with a lighter, softer look! 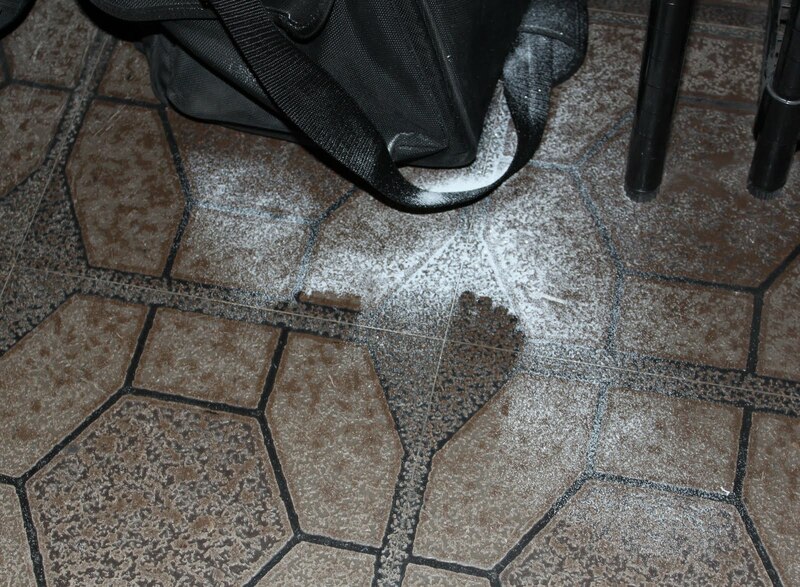 I can imagine what it would have looked like with a nice dark impression! 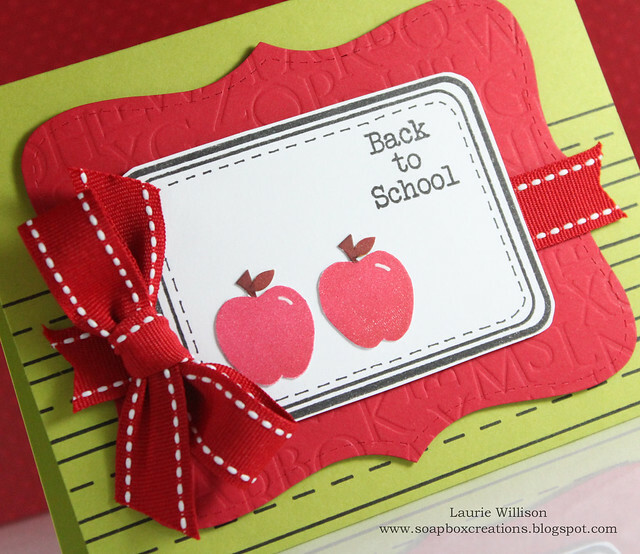 I tried to keep each card very simple to highlight the impression! So here is what I did! 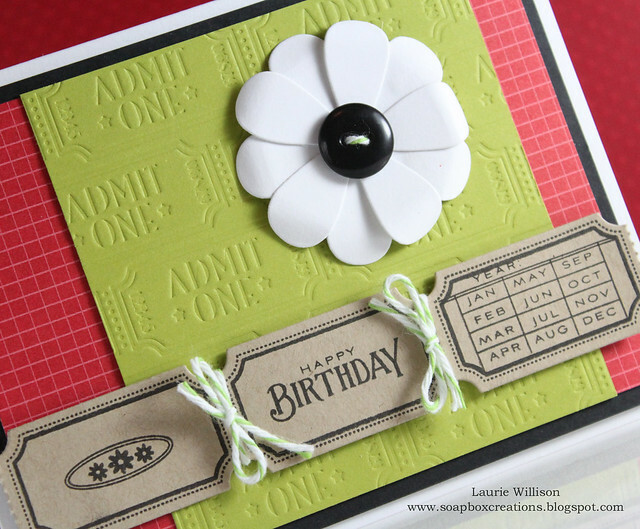 After the whole plate is covered, center your card stock on top! Next I tried it with the wood grain and Burnt Umber Palette! Such a fun way to make that impression really pop! I hope you enjoy my cards! I really like the outcome using the Impression plates so if you have a link to a project where you have used it, link it in a comment! I would love to see it! "In honor of school going back into session everywhere, we thought it would be fun to issue a Brown Bag Challenge. 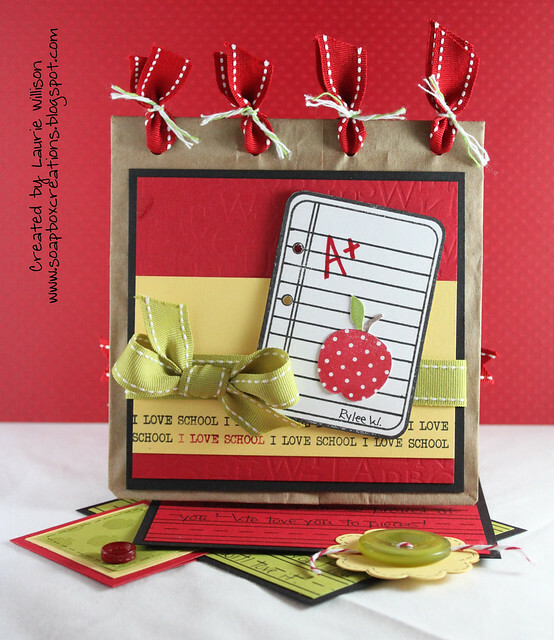 We want to see what you can do to dress up, alter, change an ordinary brown lunch bag into a paper crafting work of art. 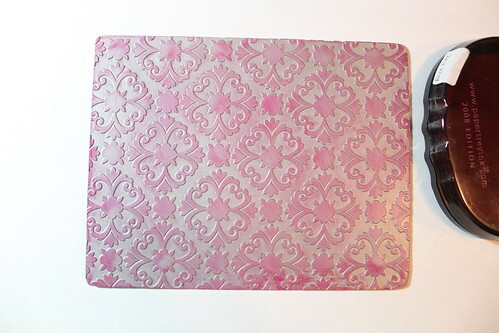 You could modify it to become a gift bag with handles, create a card base by folding it in half (complete with a slide out tag), add a window to it or whatever else you can dream up. After the hop is though, we should all have plenty of inspiration to help us create amazing projects with inexpensive brown bags! We look forward to seeing your creations!" Stacked them together, folded them in half and punched 4 holes on the folded side! With those 4 holes you can start decorating any way you like! For this album, I took small pieces of Pure Poppy Saddle Stitch, put them through the holes and then tied those off with green Divine Twine! Then you just decorate each page as you like! 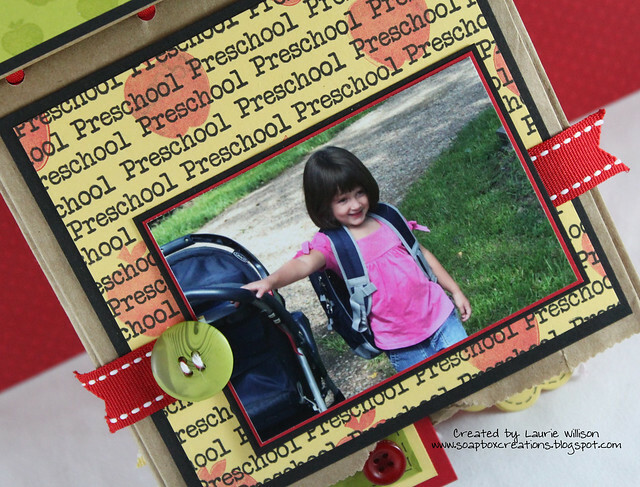 The new PTI School Time set is perfect for this little Preschool album! This library card pulls out with a little note on it! I love this ruler from the "It's Official" set! 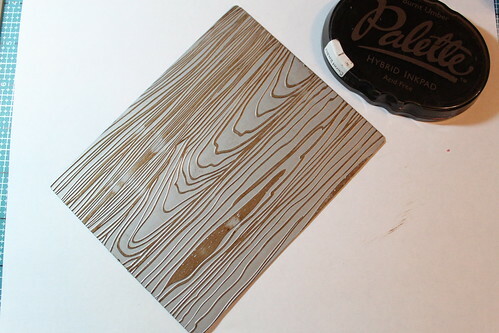 After stamping it, I ran it through my Big Shot with the wood grain impression plate! 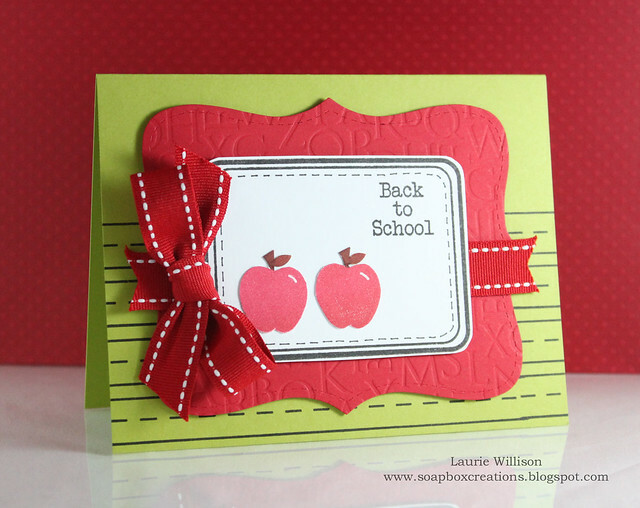 Such a fun embellishment! 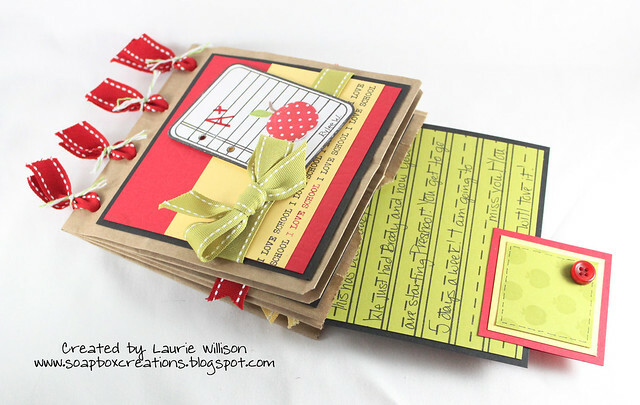 Then in each open side of the lunch bags, I slid in 2 journaling cards complete with decorative pulls! 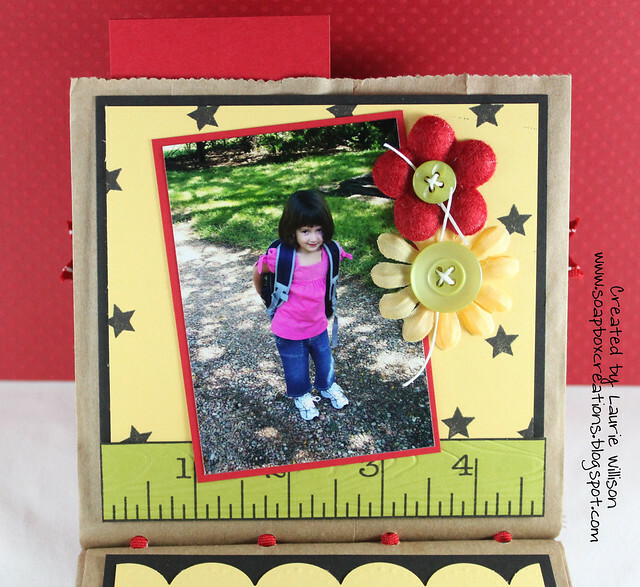 So great for leaving a personal note or telling a story! 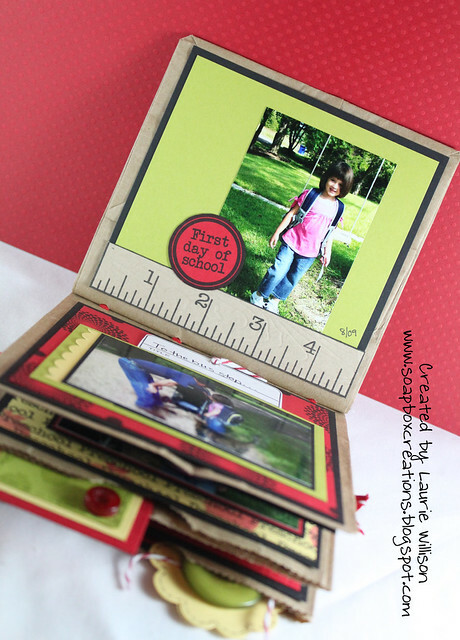 You can see here where I slide in the journaling card! Then on the back, I left just a quick personal note to my daughter! So that is my brown bag project! Hope you like it! Can't wait to hear what you think! Your comments are SO appreciated! I have purchased several digi stamps over the past year or so! I am not so good at actually getting them printed off and using them! BUT I do love them! I have a favorite and it is Heather Ellis' line of Pure Innocence! Heather is very sweet and gets the images to you right away! You can see here Etsy store HERE! I just love these images because they are so easy to color! I am still in the learning process with Copics and these are so fun to play with! Lots of room for blending! So I hope you like her! Can't wait to hear what you think! Thanks for stopping by and have a great week! The tool that I have not used is this brand new green Copic marker! Does that count? 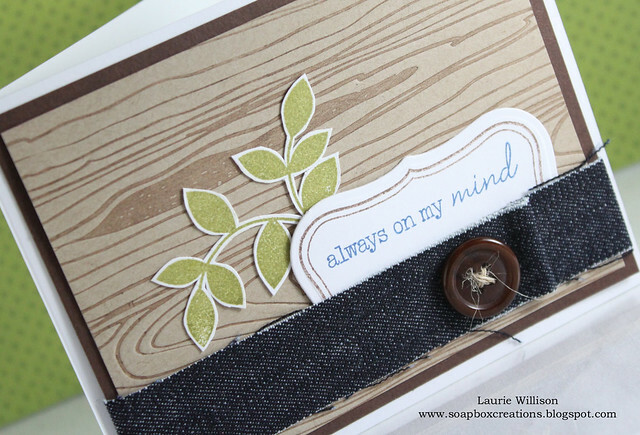 The sentiment stamp is one that I haven't used in ages! That probably doesn't count! LOL! Deadline: Entries will be due on the 4th Friday of this month, August 27th at 11:59pm MDT (Mountain Daylight Savings Time). Selection Process: Dana will announce the winner on the following Monday, August 30th. One honorable mention will be named by Sabrina (in the same post). If we are unable to contact you via the email provided in InLinkz, the winner will have until Wednesday, September 1st to email us at glimmercraft[at]gmail[dot]com to claim your prize. Otherwise, the honorable mention will be up to claim the prize! 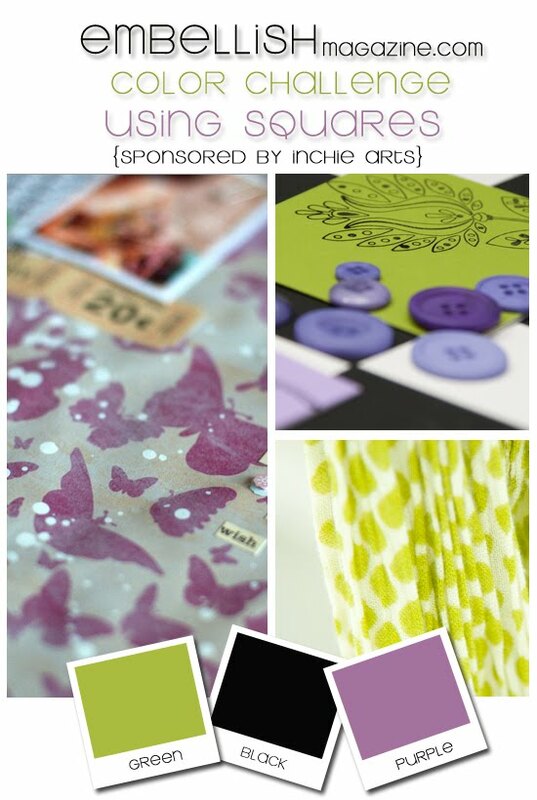 Award: On this occasion, we are offering a $20 WPlus9 Design Studio gift certificate to the winner. They have a really awesome release out this month, too! Both the winner and honorable mention recipient will receive our "Blinkie" for their blogs, boasting of your accomplishment! Stop on over to the ATC blog and play along! :) Thanks for the email Dana!! Thanks for stopping by today! Have a great weekend! I have loved seeing these tickets with the little bow in between! Had to CASE that idea! I love black and red...so why not add some Simply Chartreuse in there too, right? :) Hope you are having a great day! Some more Copics and Divine Twine! A kiss from the sun to you!